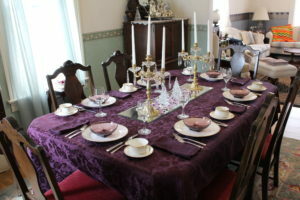 I incorporated some of my Moroccan Amethyst collection with the Lincoln China when I decorated for Christmas in 2016. So, naturally, I created some table settings using my Moroccan Amethyst pieces. Moroccan Amethyst was made by Hazel Ware, a division of Continental Can. I don’t believe the color was entirely an accident; Jackie Kennedy was admired and emulated by smart Americans, and manufacturers were quick to pounce on practically anything Jackie looked twice at. Mrs. Kennedy loved to use the Lincoln china when entertaining, and that Solferino color is unusual and striking-and not commonly found in the 1960s. Moroccan Amethyst goes so very well with the Solferino in the Lincoln china, therefore I don’t think the color’s manufacture was a happy accident! And thank goodness, because it is a lovely color. The setting is for afternoon tea and uses the same tablecloth and matching napkins, Nippon plates and centerpiece as with the Lincoln China settings (all thrift store finds). The salad/soup bowls are the Colony pattern in Moroccan Amethyst (thrift store). Four of the tea cups and saucers are Linton by Noritake and the other two are very similar but of unknown manufacture (rummage sales). The goblets are lead crystal ones made in West Germany (thrift store). The flatware is my beloved Great-Grandma Mayer’s Coronation by Oneida.